Michael Laverty on the Tyco BMW in 2016. Michael Laverty will join Christian Iddon in Northern Ireland’s Tyco BMW team for the 2018 MCE British Superbike Championship. As exclusively revealed in the News Letter on Tuesday, Laverty will compete on the S1000RR this weekend at the Sunflower Trophy meeting at Bishopscourt in Co Down. Northern Ireland's Michael Laverty last won the Sunflower Trophy race in 2010 on the TAS Racing Relentless Suzuki. Laverty said: “I'm delighted to be returning to the Tyco BMW squad for the 2018 season. We enjoyed success together taking race wins in 2015 and 2016. A dip in form lead to a year’s sabbatical, which didn't prove fruitful, although the experience gained this season will make me a stronger rider. 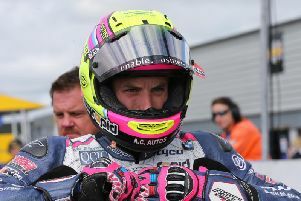 Looking ahead to his return to the Sunflower meeting, which was first won in 1977 by Isle of Man TT legend Joey Dunlop, six-timer winner Laverty said he was relishing the chance for an early outing on the Tyco BMW. Team Manager Philip Neill added: “We are extremely pleased to welcome Michael back to Tyco BMW after many previous successes together. Michael secured our first British Supersport Championship and recorded our first race victory in Superbike. “We enjoyed considerable success together in 2016 including two race victories, although we did lose our way somewhat towards the latter part of the year. One year further on, and we can now use the experience to strengthen our working relationship for 2018.